An (award winning!) regularly updated concluded blog post in which I document trying to get a license to reuse an item for which no copyright information exists, under the UK Government's new legal framework. Diary Entry 1: Weds 29th October, 1.16am UK time. exceptions, seek the permission of the creator or right holder. If the right holder – or perhaps one of a number of right holders – cannot be found, the work cannot lawfully be used. This situation benefits neither the right holder, who may miss opportunities for licensing, nor potential users of those works. This is not a situation peculiar to the UK; other countries face the same issues [source]. A new framework was announced as part of the Enterprise and Regulatory Reform Act 2013, and has been implemented after a consultation process earlier in 2014. 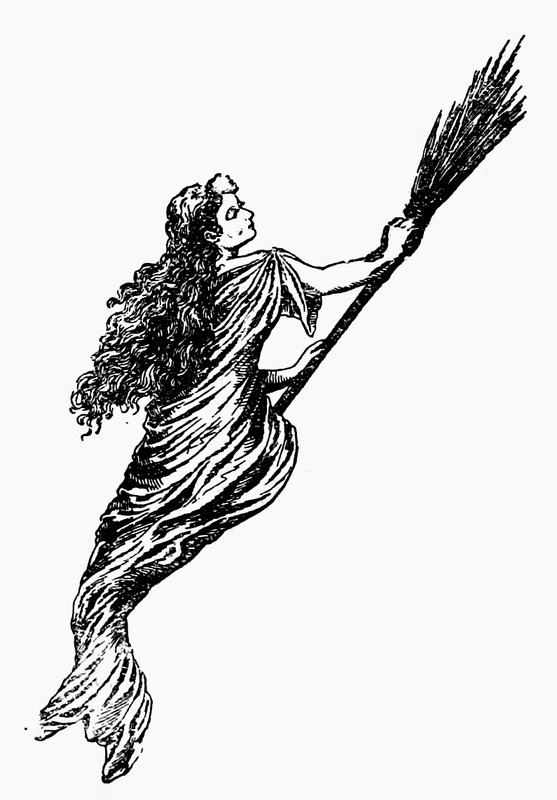 The UK government also introduced regulations to ensure that they comply with the EU Directive on Orphan Works. This new scheme will be administered by the UK's Intellectual Property Office. In my previous blog post I introduced a lovely orphan work, from the mid 1960s: a"lantern" interval slide tempting patrons to buy an ice lolly, used at the Odeon Cinema, Eglinton Toll, Glasgow. The image is used here with permission from the Scottish Screen Archive, National Library of Scotland. It's part of a collection of Lantern Slides, with no individual collections record. It has a small identifying note to say it was made by Morgans Slides Ltd, which is no longer trading. The Odeon cinema were contacted, but their records dont go that far back for design so they cannot prove they own copyright, but they gave me permission to use it if they do, with the caveat that a copyright owner, whom they cannot speak for, may come forward at some future date. It's an orphan. I want to adopt it, so I can use it widely, but also, to investigate how easy? hard? costly? problematic? easy? it is to get a license for orphan works under this new scheme. So let's go! This blog post will expand over time as I update on the process. I have all the data I can get on the item gathered, and am ready to roll. I contacted the IPO last week via email, and they promise that "all the relevant information on how to apply for a license and the due diligence needed will appear on the website on Wednesday morning". There's nothing up there yet (I'm on Australian time writing this, in Melbourne, and its only just past midnight in the UK)... but will check back later, come UK business hours. Its taken me a week to update this - not because I'm not interested, but because I'm over in Australia just now on a lecture tour, and its been a jolly whirlwind of lectures, lunches, masterclasses, flights, trains, dinners, and kangaroo spotting. Excuses excuses. I'm now in a hotel room in Sydney with a few hours spare of an evening and an actual internet connection: lets get to it. The first thing to report is that the IPO read this nascent blogpost and contacted me! The Head of Copyright Delivery, from the Intellectual Property Office, thought my blog was interesting, and we've already exchanged an email or two: they are interested in the needs of our sector, and want to assist in this. Isn't that interesting (and slightly scary - that's social media for you) - and I assured them that I wasn't doing this out of "lets see what is wrong with the process" but in the spirit of genuine exploration. The process is clearly flagged as in Beta, so lets all proceed in manner of mutual respect, and give some feedback as we go. I'm happy to be a guinea pig. (I'll flag up recommendations to the IPO with a bold IPO: for easy scanning). Then, work out what license you want. So lets go through this check list, to get that first phase out of the way. 1. Check that the work you want to copy is still in copyright because if it isn’t, you don’t need a licence to use it. TICK! we have an orphan item right here. UNTICK! exceptions are for Non-commercial research and private study; Text and data mining for non-commercial research; Criticism, review and reporting current events; Teaching; Helping disabled people; Time-shifting (eh? Dr Who a go-go); Personal copying for private use; Parody, caricature and pastiche; Certain permitted uses of orphan works (which allows the GLAM sector to digitise orphan works and make them available online); Sufficient acknowledgment, and Fair Dealing. Now, I'm no lawyer, but none of these are me: what do I want to do? I want to take an orphan work, and make some fabric with it using it as the basis for a pattern, and perhaps make a few items of things, which I might want to sell on etsy, or put the pattern up on spoonflower, etc. Yes, there is a teaching and research element to this, but by the same token, the teaching and research is in the fact of making it available, and chasing through the process. It's not commercial a la huge superstores, but its certainly not uncommercial, even though the chance of making a profit is slim. I'd say that there were no exceptions to copyright for me in this case, so we (un)tick the item, and proceed to the next in the checklist. 3. 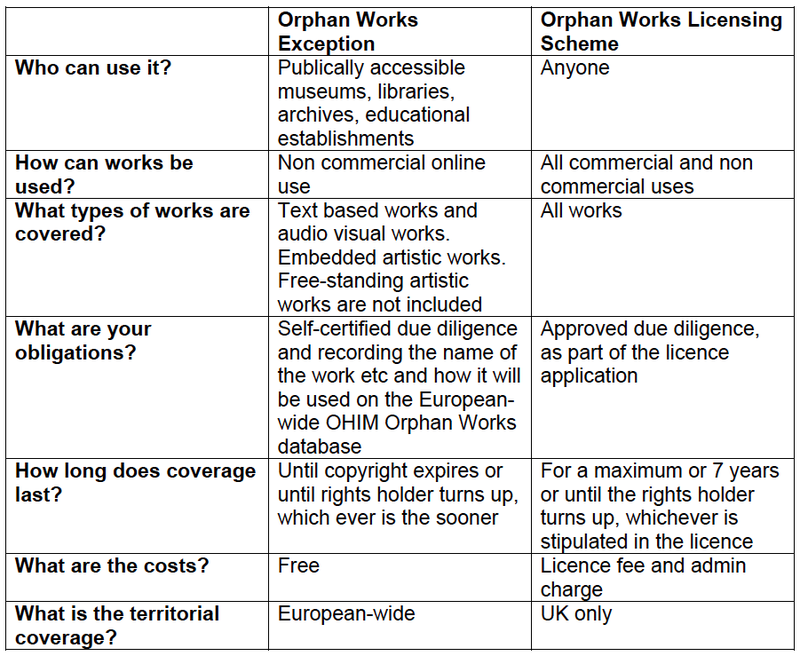 Read the guidance on orphan works and take this short questionnaire to find out if you are eligible to use an orphan work under the EU Directive. Read it (interesting read). 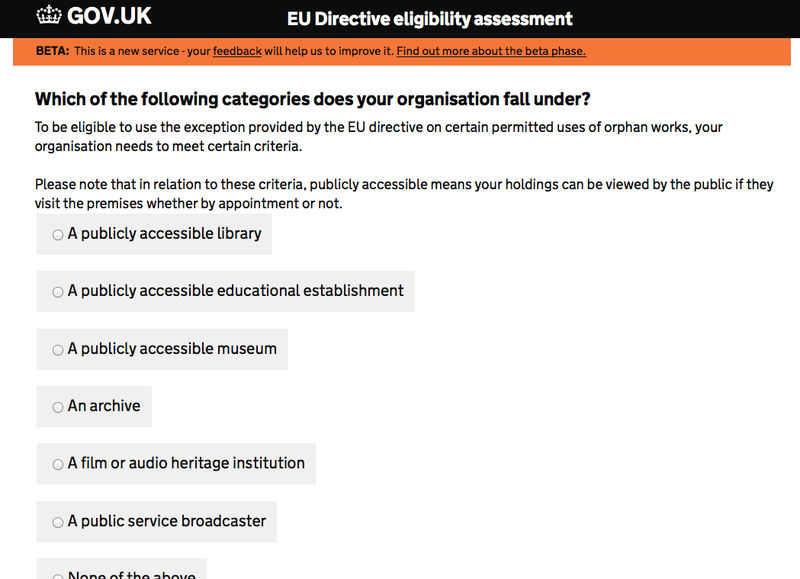 The checklist for the EU Directive the first thing where I go... wait a minute, Gov. See screenshot. I'm not exempt, as I thought, although who knows because of the organisation thing... so lets crack on with the licensing scheme. TICK! I have all my info here, good to go! 5. Complete the diligent search checklist(s) and convert these to one PDF document to upload as part of the application process. 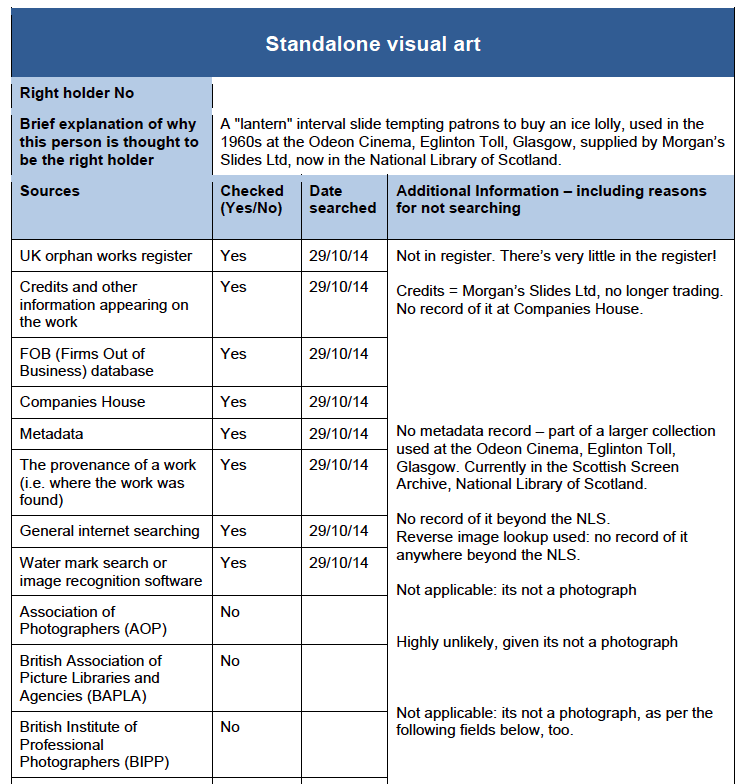 The list of places to check goes on and on: British Society of Underwater Photographers (BSUP), Bureau of Freelance Photographers (BFP), Chartered Institute of Journalists (CIOJ), Editorial Photographers UK (EPUK), Master Photographers Association (MPA)... I make it 55 different places you have to check to claim that it is an orphan work, which is fine: you want to be diligent about this (the clue is in the title). But, recommendation 2: IPO it would really help if you said exactly where you wanted people to check (giving URLs would help a lot) and how - for example, "water mark search or image recognition software" is quite a broad church. Another thing recommendation 3: IPO is that a lot of the places are societies, and I'm not sure what they thought you could do there, or what they have that is relevant. 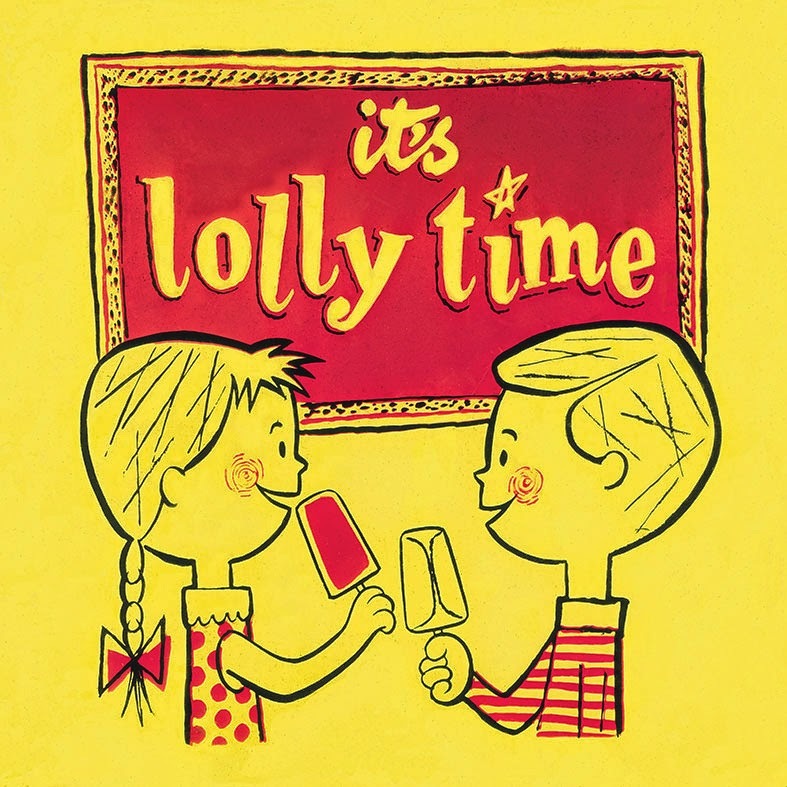 For example, if you go to the Professional Cartoonist's Association website, you can browse portfolios, but I cant seem to search for "lolly time", and its much more a membership organisation than a repository for content. So I'm not sure what I'm being asked to check: that I had a quick look at the website? that there was nothing of relevance because they dont have a repository? that I was supposed to email them and ask? Guidance on that would be super useful. Now on to choosing a license that you are applying for! And it is here that the fun starts! Because that's where you get to play with the cost calculator to buy the license. Umm... I dont know. Illustration? Maybe? And then comes the killer question... DA DA DAAAA! But first, I have to choose how much surface the item will cover? IPO recommendation 6: I'd suggest this is a nonsensical list. Why? Well, repeating patterns are pretty common. How do they relate? My scarf is bigger than a "page". So what does this mean? And what is a page? A4? A3? A0? you might want to revisit this. 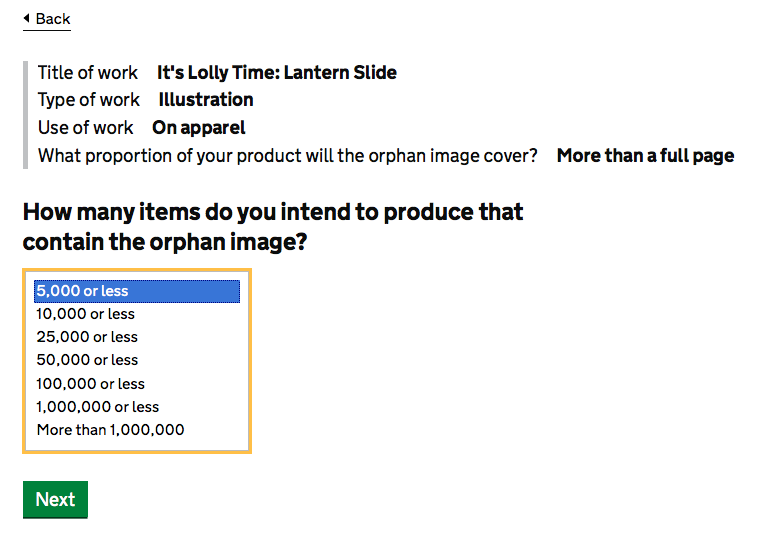 My orphan image will cover as much fabric as you can print out, as its repeated. But lets go the nuclear option, and tick "more than a full page" for a commercial license, for apparel! You are then asked to choose how many things you are going to make to sell. I'm thinking of making two or three, just to test the waters (starting up as a sole trader, remember!) but the minimum item load you can make, in the licensing structure, is.... 5000! IPO recommendation 7: its clear that these structures are geared towards large corporations, rather than individuals or sole traders. I'd revisit this: you want to help bootstrap creative making, not treat everyone like Walmart? But I'll click 5000 or less for now. Then you have to choose how long the license is going to last for. So here we are. A 7 years license to use an image on a repeating pattern for apparel that I can sell, less than 5000 items. And the cost comes to.... drumroll!!!!! Did your eyes go as big as mine did when that figure popped out? Now, its clear that I've stumbled into the commercial sector line here, and this is probably a fine amount for an image license if you are a major clothing retailer. 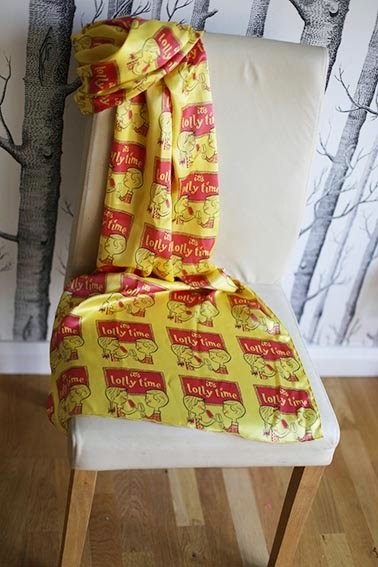 But there is no way that I can stump up over £2.5k to allow me to put some scarves on etsy, or fabric up on spoonflower. I need to email the IPO and ask about this, which I will do next, and report back, but before I do ... I wonder who is benefiting from these license costs? Where does the money go to? I'll ask the IPO about that and update the blog with the info they supply. A mere ten pence for non commercial use (hurrah!). But I'm not sure if what I want to do is covered under this list. Perhaps "personal use" - it could be argued that I am just making the digital files available for people via spoonflower (or I could make the digital files available to print up a scarf, and tell people where to go and get one if they do), but my dreams of etsy stardom reusing digitised content have been dashed. It's clear that I need to talk to the IPO about this and ask the best way to proceed - and I'm aware that I started a very public conversation right from the get go - but it does seem to me that the licensing structure, as is stands in Beta, allows reuse for freebies but doesnt really allow people to make products out of orphan material, unless they are for personal use only - and to be fair, I got that license from the NLS in the first place, so I'm not sure what is to be gained here, appart from the fact I could now share the source files of the item I made for personal use with everyone else. The licensing costs do hamper anyone wanting to start making and selling at a cottage industry scale, which is the majority of the online marketplace over at places like etsy, and probably a major source of reuse for this content: it should be opened up for everyone to use? Or am I being naive or utopian? So I'll take this back to the IPO, and ask them to think about how this helps or hinders uptake of this material so you can actually do something with it if you are not a corporation, and report back. I'll also ask for the table of licensing costs from the IPO, which must exist somewhere, so that I dont have to spend ages with the online tool manually drawing that up myself. 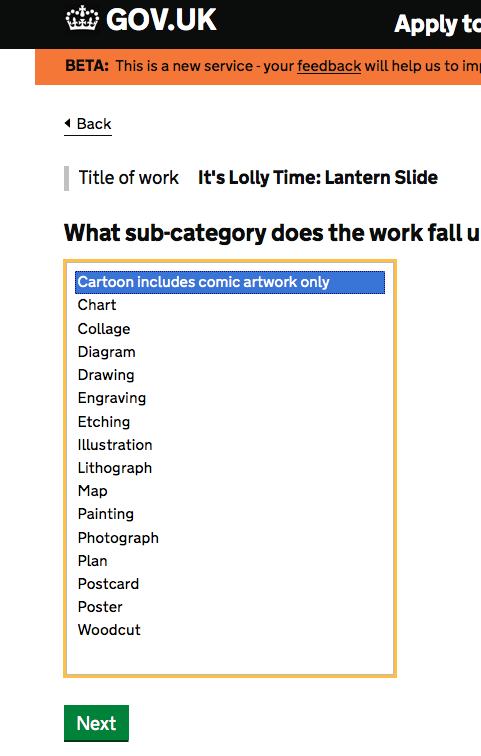 The online tool is pretty straightforward (save the baffling question about pages?) and usable, given the complexity of the range of uses people must be asking them for, and its great that it went up on the day the legislation changed. 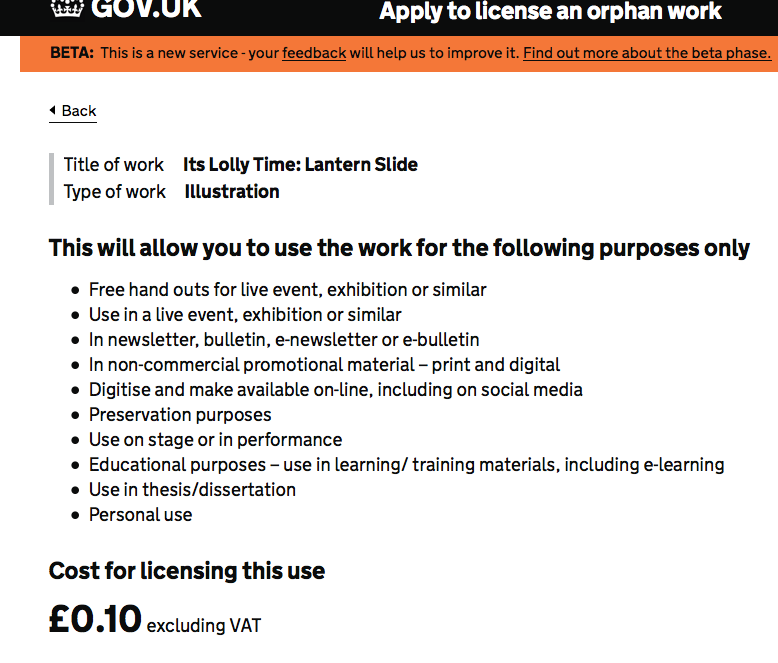 The orphan works scheme - especially the 10p non-commercial license - is fantastic for the heritage sector as it does clear up a lot of issues with reusing content for not for profit usage, but I was hoping I could do something more... I'll be right back when I have more to report, travel and poor internet access notwithstanding. The delay to updating is all my fault, due to catching up on life and work (and sleep) upon my return from Australia. The IPO were really very quick to respond to my query, and it has sat in my inbox for a couple of weeks (sorry for being so tardy IPO, and thanks for being so speedy yourself). Here is what I asked, and how they responded. I quote directly from an email to me from the Head of Copyright Delivery at the IPO. 1. I asked: Where does the money from the licenses go? The application fee covers the cost of processing your application. The licence fee (minus the VAT of course, as that will have been transferred over to HM Treasury) is held in case the right holder for the work comes forward. They have a period of 8 years to do so, and if we are satisfied that they are the right holder, we will pay out the licence fee. 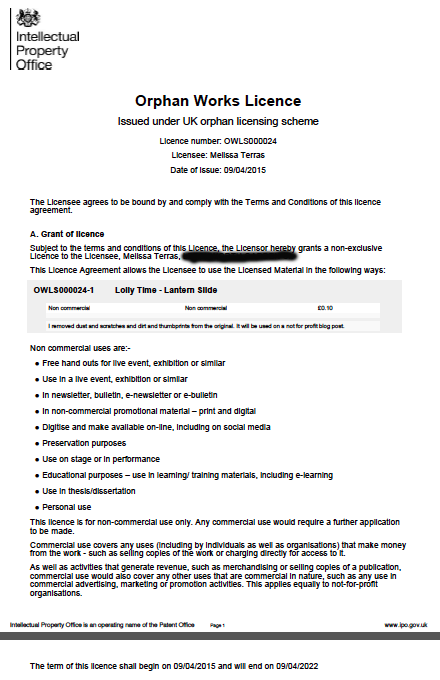 If they do not come forward in 8 years, we can use the money to pay for the set up of the licensing scheme, and also for ‘social, cultural and educational activities’ (regulation 14 of The Copyright and Rights in Performances (Licensing of Orphan Works) Regulations 2014 - http://www.legislation.gov.uk/uksi/2014/2863/contents/made). 2. I asked: Even if you only sell one or two things, do you need a commercial license? As you set out in your blog, if there is any money changing hands for the use you are making, it counts as commercial. If you are going to put the pattern on Etsy or similar for free, it would be non-commercial. 3. I asked: Can I get a copy of all the licensing costs? Our pricing structure runs to literally thousands of possibilities for licences, so it is not possible to send you all costs for commercial content – it really depends on the type of orphan work and the use you want to put it to. 4. I asked: How were the licensing costs worked out? Were commercial costs used as a model? We undertook a detailed analysis of prices for non-orphan works, taking into consideration both the type of work and the use. This used information from a wide range of sources, both commercial and non-commercial providers. We had always committed to ensuring that orphan works do not distort the market unduly against non-orphan works, which provides a certain level of reassurance for right holders and licensors in the market. 5. I asked: Is a license exclusive? So if you pay all that money, could someone else also get a license? The licence is non-exclusive, so someone else could apply to use the work for a similar or different use at the same time as you using it. This is because we have no way of knowing whether the right holder would negotiate an exclusive licence or not. They also directed me (and you, dear readers!) to the scheme overview guidance on gov.uk: https://www.gov.uk/government/publications/orphan-works-overview-for-applicants. This makes it much clearer for me, and I can see the reasoning behind such decisions, although I'm going to ask them to offer a significantly smaller run of items (the minimum you can get a license for is 5000 at the moment, which really does stop small businesses experimenting: a minimum license of 20? items, with a license fee reduced in ratio to the number of items would bring the license costs way down, whilst allowing our kitchen-table makers to use orphan works in items offered for sale at a small scale). I'll ask them, and brb, honest. I also have an issue about orphan works being offered for sale at the same licensing rates as commercially available art is... although I can see why you dont want to flood the market with low cost design materials and put today's beleaguered designers out of work (its a tough enough gig out there at the moment). However, this still means that there will be so much really fab cultural and heritage material locked up in institutions that people cant afford to use. Harrumph. I also consider that there must be a model that generates all the costs: its not like computers spit out all this stuff themselves without any human input. I do know a little about that, in my line of work. So I'll ask again about getting hold of the underlying model that generates costs. And what am I going to do, myself? Well, I'll wait til I get a response about lowering the number of licenses available, and if they do, I'll buy a commercial license for 20 units, and get my make on. But if they wont, all I can do is apply for the non-commercial license, and make source files available for others to use in a not for profit manner. There's very little in that for me (for the price of £20.10, including processing fee) but I feel I should see this process right through to the end, even if it isnt the magic, transformative process we had all hoped for, for the cultural and heritage world. It's worth pausing for a moment here, to think about what the alternative to chasing such a license are. 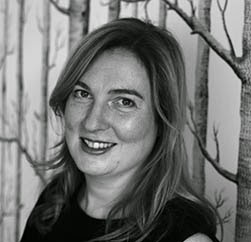 Of course, there were a lot of changes to the law in October last year regarding copyright and orphan works, not just the orphan works scheme, but exceptions to the scheme. Just before Xmas I had the delight of taking one of Naomi Korn's one day courses on Digital Copyright. She was keen to point that for many institutions these exceptions may be more than adequate for their needs, and compares the exceptions to the licenses in a table below, which I've been given permission to reuse from a forthcoming piece by Korn called "The Orphan Works Dilemma". 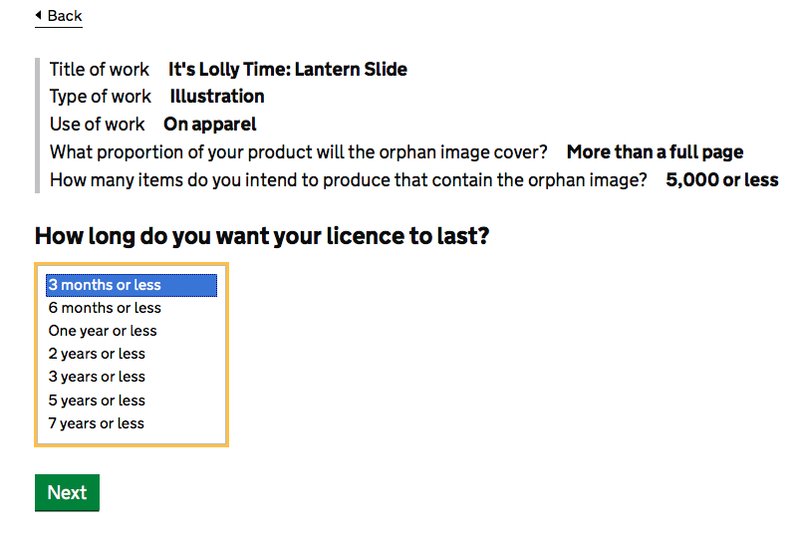 In many cases, provided due diligence is undertaken (and there's a guide from the UK government on how to do that) then reusing items under the Orphan Works Exception is preferable, easier, and more cost effective than pursuing a license via the orphan works scheme. Its therefore worth exploring this option first, before thinking that a license is necessary for every reuse case of an orphan work. For my use case - small run commercial printing, by an individual - the exception doesn't count, so its not a route that is open to me for this particular case. But for many libraries, archives and museums, wishing to display orphan works, or use them in a non-commercial way, the orphan works exceptions are more practical than trying to obtain licenses. You asked for a licence for 20 items or less, rather than the 5000 items which is the minimum for using a still image. This is something we will consider going forward, which is why we have a contact form in the application process to allow people to say that their use is not listed. I obviously cannot guarantee that we will offer it, as it depends on us getting sufficient evidence of its need. Do you have any evidence of licensing which allows such small numbers? We would be able to take that into account in making a decision. You asked about the underlying mathematical model for the fee calculations. I am afraid we are not in a position to share this with you. As I have mentioned before, we have used publicly available licence information which we researched and averaged (commercial and non-commercial). We then took into account relevant factors like the fact that we only offer up to 7 years for the licence whereas non-orphan licences might be available in perpetuity or for other lengths, non-exclusivity versus exclusivity and territoriality. As I said before, this means we do not have precisely the same prices as Gettys, for example, although they were one of the sources of information because they have publicly available information. After the 8 years, as you know the unclaimed fees are first use to defray the setting up and running costs of the scheme. Then any excess will be used at the discretion of the Secretary of State for social, cultural and educational activities. This could be a wide variety of activities, which might include cultural heritage research, digitisation projects or benevolent projects for right holders. It is some time in the future, so it is difficult to say what might qualify under any given Secretary of State’s opinion, but I hope that gives you a better sense of what might be included. Interesting. I think (1) is rather the wrong way to think about it: they have compared commercial licensing costs for stock photography with the licensing of orphan works that are mostly of historical importance, within institutional contexts... It is rather like applying rules for apples to those for oranges. There is an opportunity here to do something different that will help the use of content in the library and archive sector, not just to ape what is happening in industry (with a licensing structure that is set up to maximize profits and minimize time wasting experimentation). The model really doesnt apply here. But that said, the lowest licensing number that the IPO offers is for 5000 items, but a quick look at the main stock photography licensing sites shows that iStockPhoto licenses a maximum of 2000 items of apparel created with an image. If I understand it correctly, BigStock's license allows you to print on apparel with no limit, with the cost of each image being significantly less than the quote given here. You could spend weeks working out the licensing structures for stock photography, which are often not comparable across websites, and I dont think that the costing structure here has really been worked out in such a way to take the needs of the library and archive sector into account. I understand the need to balance the needs of commercial artists, photographers, and illustrators, but I think concern for them has outweighed the needs of the cultural and heritage sector. Given the costs, and the restrictions, if I were in an institutional context such as a library or archive, I wouldnt advocate going down this licensing route at all, but I would try and do what you could do within the exceptions, as detailed above. 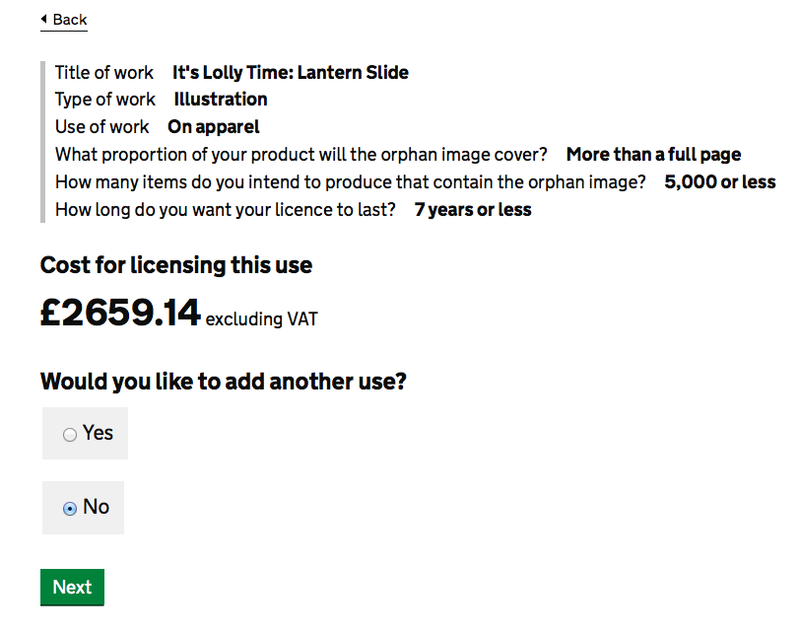 The orphan works licensing scheme is good in theory, but in practice it seems overly concerned with the models for commercial stock photography, and not at all concerned with the needs of the gallery, library, archive and museum sector. I think (3) sound fair - 8 years is at least two governments away, so planning ahead for the state of culture and libraries and museums is like chucking darts blindfolded, anyway. But remind me in 8 years to file a FOI request asking about income and revenue from this scheme - if FOI requests still exist then ho ho ho! (hollow laughter). So that brings me to the end of my quest, I think. 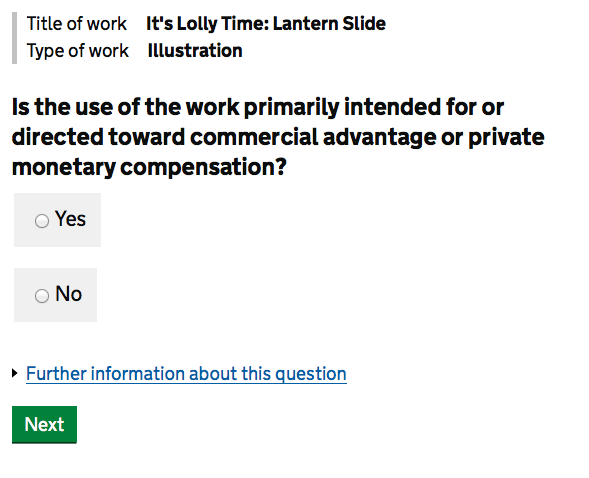 I'll continue to engage with the IPO about the licensing number question, and fill you in if there are any changes, but its clear that at the moment, as it stands, the scheme excludes people like me: sole traders, wanting to use orphan works in small print runs. And the scheme is too unwieldy, time consuming, and costly, to allow any more than the odd item to be licensed: those wanting a non-commercial license are better trying to look at the exceptions, first. So where is the license? I've tried to get a non commercial license, I really have. I spend 15 minutes carefully filling in all the details to the online system, then I fail at the last hurdle, as it wont let me upload the due diligence form. I've tried different browsers, but no. I cant save that 15 minutes of data entry, and need to start again every time. It seems like not only the process is broken, but the online tool. I have emailed the IPO about it, but I think I'm done. I tried, I really did. 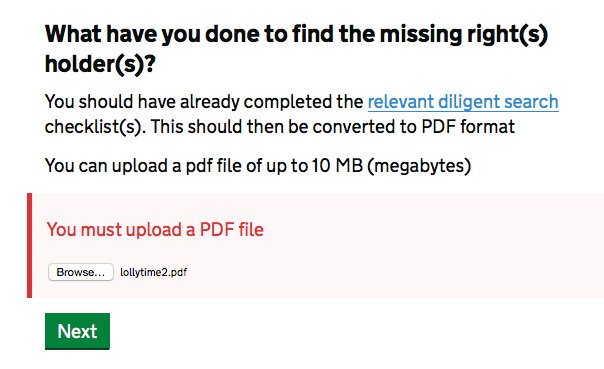 I keep getting an error message asking me to upload a pdf file - when I have tried to upload a pdf file. What has the take up been across the sector, given the licensing scheme has been running for the past 4 months? In total there have been 228 licenses issued altogether to date, with 200 of those from one museum alone (Museum of the Order of St John) and a further thirteen to the Rawk Agency ("one of the UK's leading providers of boutique and marketing events"). According to the "In from the Cold" Jisc report on Orphan Works, "across UK museums and galleries, the number of Orphan Works can conservatively be estimated at 25 million, although this figure is likely to be much higher" [link]. 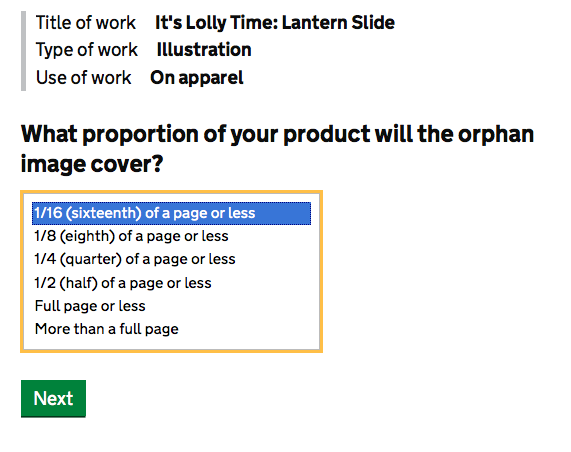 The Orphan Works licensing scheme is not being used to make these available in any numbers worth considering. This blog post was nominated for, and won, the "Best Exploration of DH Failure" category in the Digital Humanities Awards 2014 following public voting. Thanks! And finally, in April 2015, I got the license. THE END. Now what? Isn't she handsome? 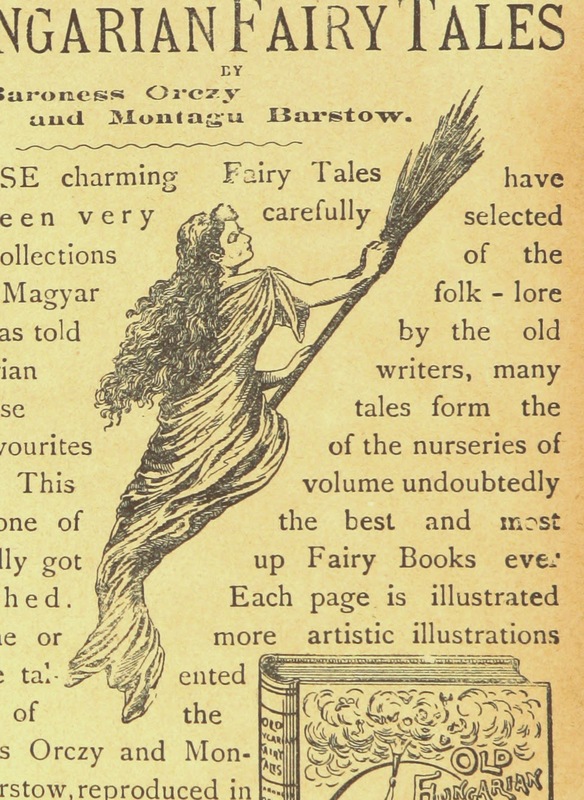 An illustration tagged with witch, over at the British Library book images photoset, Flickr. Originally taken from "Life & Finding of Dr. Livingstone", 1897. 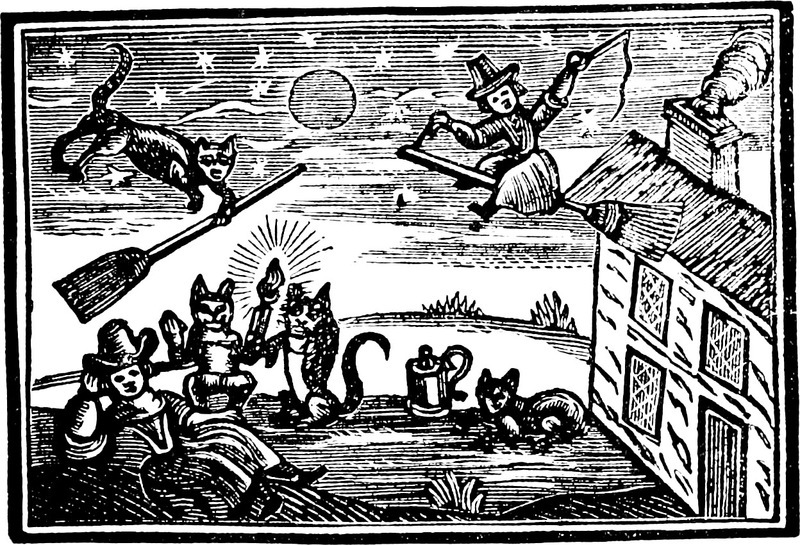 But bother about all that writing, which makes it unusable on my Halloween party invitations. It would be better if there wasnt all that writing, just the image, right? Or even, make the background transparent. Ta da! take it and do with it as you like, please do. Nice, huh? and all this took me was time. An hour or so of grubbing about on flickr, an hour or so of messing around in Photoshop (I'm rusty). And as we all know, time is precious, and institutions dont have that level of time to devote to this kind of thing. Hmmm. I also wonder what I'm really doing here. Turning images into clip art? erm, yay? Is that what we mean by reuse? But why else are we making images available, if its not for people to take them and do something with them? Does this make them more "useable"? Its certainly more easy to take the image and dump it into a poster, or webpage, etc. We need to ask ourselves what we mean by use and reuse, if we cant conceptualise what that really means in the first place. But I said 5 images, right? I'm time pressed at the moment (shortly off on a big work trip), so - being honest here - I signed up for the first time to Fiverr, where you can get a myriad of small tasks done for $5, and bought some photo retouching for photos, and within an hour, I had four other Halloween images, this time from the Internet Archive Flickr Pool, converted into black and white, with transparency too. 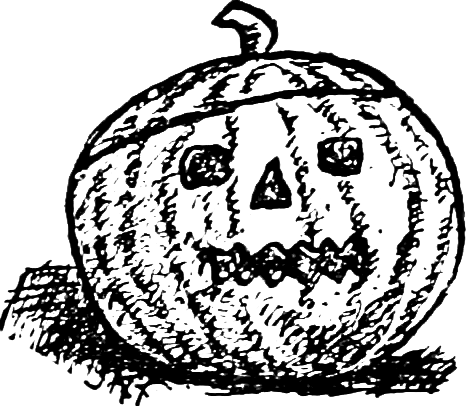 A set of Halloween images! But Fiverr made me feel icky - even though this fixing up would be a relatively simple task for someone with better PhotoShop chops than I to do, and even though I chose someone who said they were a student in a first world country, it just seems such a small amount to pay someone. (I did try to engage them in conversation about that, and offered going hourly rate I would pay a student: they didn't reply). I am happy with the images provided, but I wouldn't advocate institutional use of this type of service if it can be avoided, something about it feels exploitative to me. It was interesting to try. (Perhaps its part of my penance that I share these images here for everyone but... shudder. Is that how we value skills now? Sorry, world. I know is the market economy, but, doesn't mean I have to pay people less than I believe a job is worth). I parked this, and a selection of others I found that I'll put at the bottom of this post, on a group over at Flickr. There's been obvious interest in them, with a total of 50 views or so in 24 hours, even though I didn't tell anyone where they were, yet. So I'll leave them up there, and take them if you like! I think they are cute. Do something, they are in the public domain! they are free! Use them at will! It only cost me time and some perhaps student's time and $5 and the electric that drives the internet and the heavy metals that are in our computers etc etc! and if you fancy telling me how you used them, on here or on twitter, that would be great, but you dont have to because its public domain! woohoo! (I may do some reverse image lookup in a while and see where they got to). This is a minor experiment - especially compared to my last blog post, which was much more of an investment in both time and money - but it goes back to what I was saying previously about the time and skill needed to use the image content available successfully. Its not all just "there" yet, you need time to sort, and time to manipulate, and resources to do so. It also makes me think of what you read about in pre-print times, when artists' workshops had teams of people working for them who just painted silk, or hair, or skin or whatever, and the whole thing was a production line, where you farmed jobs out to other painters - sure, its a makers revolution, but its one that involves getting a student to do a quick job on PhotoShop for you, or a print shop to do some formatting and printing. You can take the content and do something with it, if you have the resources to both pay for and manage the process. The stuff is in the public domain, and is free. But doing something with it isnt, not really. Except, of course, I'm not Raphael, I'm just messing about with images taken offline and turned into slightly cleaned up versions of themselves for clip art. I'd like to see a "real" collection do a longitudinal study on the benefits of this, releasing some of their content in different graphic formats, and tracking interest... hmmm, a potential MA student dissertation for this year, perhaps? Its a worthy topic, and one that should be pursued in more than a couple of hours, and a hurried blog post. 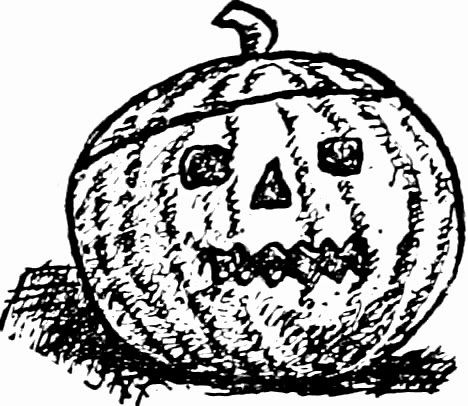 Still, Happy Halloween, and feel free to reuse these in any way you like, should you want to. The full size I have is up here, made smaller to fit in blog format, you know what to do to grab the larger file. Black and white jpgs first, then transparent png. 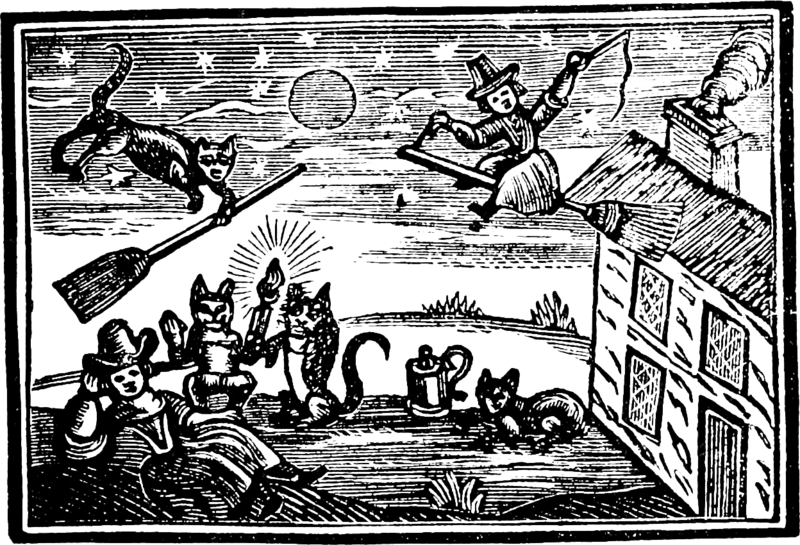 Originally taken from the Internet Archive Book Images Flickr Pool. It started off pink, mind! 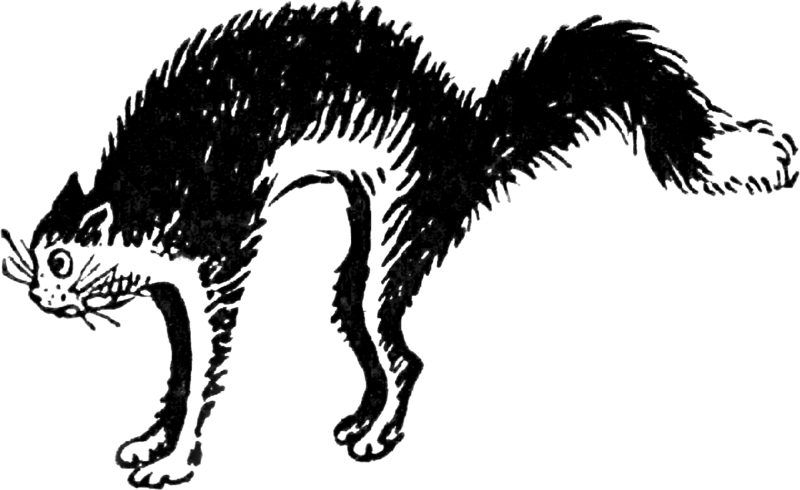 Originally taken from the Internet Archive Book Images Flickr Pool. 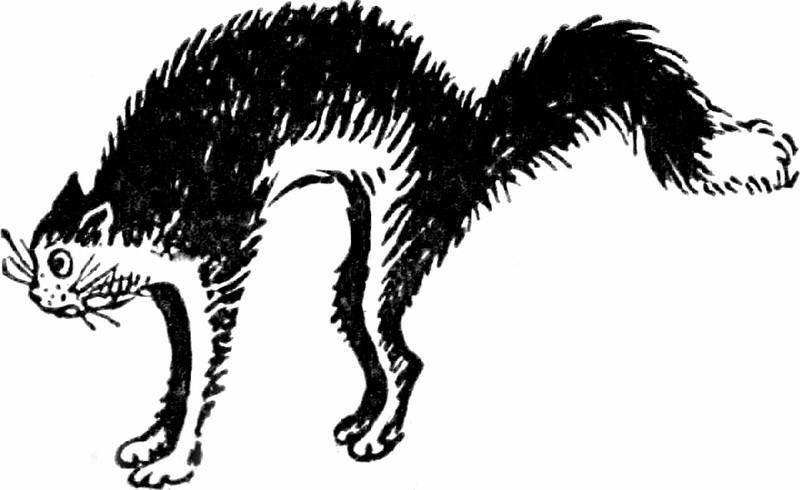 Originally taken from the Internet Archive Book Images Pool. Brilliant. All of them over at Flickr, too, if you'd prefer. Have fun! And don't have nightmares. Following on from my previous post in which I bemoan how hard it is to reuse digitised content as a source for creating something, I reuse a digitised image of an item in the National Library of Scotland, discovering how tricky it is to reuse images of "orphan works", but producing something that, well, I like! Look at that! How cheerful is it? And right up my street. I kept going back to it and going... ahhhhh! But was it digitised in high enough resolution, and could I get permission to do anything with it, given it is quite clearly still in copyright? The folks at the Scottish Screen Archive, and the Intellectual Property Officer at the National Library of Scotland, couldn't have been more helpful. Yes, they had previously digitised it at high resolution (all 69MB of it), and I could get permission to use it for my own use (and to feature the image(s) here on my blog) for the princely sum of ten of your British Pounds for the license. I also contacted the Odeon: their records dont go that far back for design so they cannot prove they own copyright, but they gave me permission to use it if they do, with the caveat that a copyright owner, whom they cannot speak for, may come forward at some future date (and hey, stranger things have happened once you put things into the blogosphere, if anyone knows anything about the illustrator, please get in touch). This lantern slide is officially an "orphan work", then. This means it isn't in the public domain, and I cant reuse the high resolution image provided from the SSA willy-nilly (such as making a pattern for anyone to use with it, or giving away the source files, or putting it up on third party website such as spoonflower), under the terms of the license agreed. But it means I can use it for personal use. I'll come back to that later, but lets crack on. The process of turning this into something was straightforward. Once I had the high res file, I spent a few hours tidying up the image, removing some scratches and marks from the slide: this is a fragile, opaque, archival item, and it's no wonder that, close up, there were some marks that may detract from print quality. Its a line to walk, though: you dont want to make it too cleaned up. It still wants to look original. Before and after, with a bit of cleaning up in PhotoShop. It's not a huge difference from the original (and I havent put the full resolution file up here that I have, I'm not allowed to), but it just makes the whole thing a bit fresher for printing. Then it was just a case of more PhotoShop jiggery pokery, measuring up, tiling, choosing my printer (I went with BagsofLove, a UK company which seems to offer quite a range of printing: people online say that if you order from Spoonflower, a company based in the USA, import duty can really make the costs mount up for shipping to the UK). Ta da! A pure silk scarf, with repeating motif. Cute, huh? Bagsoflove offer silk printing plus hemming, given a lot of people want silk scarves to test patterns. I got quite a large one made, and the whole thing cost £100 all in, ready to wear). And here I am wearing it! 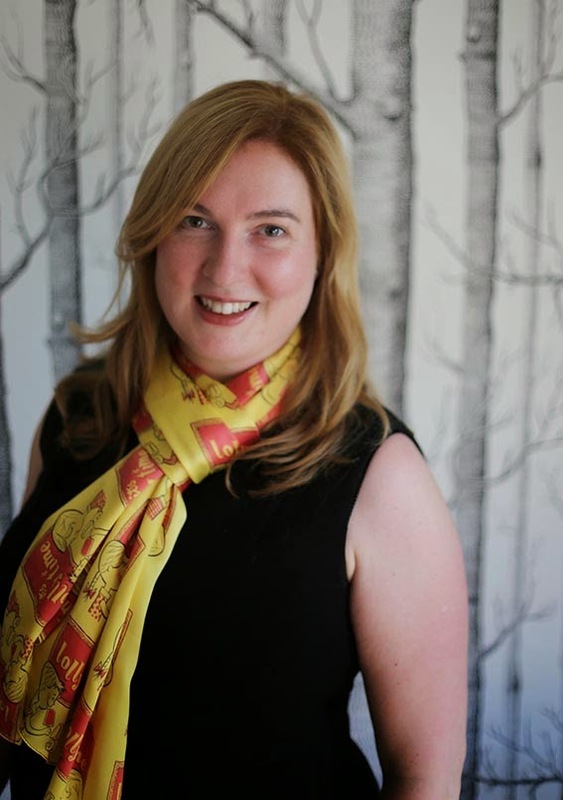 While we are talking about copyright, etc, this photo was taken by my 6 year old who has given me permission to post it here (which also might explain why all the scarf is cropped out on the left! but you get the drift). Do I like the resulting item? Well, I chuckled when it came in the post, so yeah. I do feel as if I've made it - a few hours navigating licensing issues, about 5 hours total in PhotoShop, a few hours choosing where to get it made and what to get it made into, so it feels like I've had to invest time (and some brain effort, in working out tiling sizes, etc, and what I actually wanted size wise: this was a significant investment in time and cash, so its good to get it right). It's already made me think about the next digital printing project, which means the whole thing must've been fun. Working, as I do, with so much digital data, its nice to actually have a product at the end of the day. Going with silk was expensive, and there are cheaper options available, but I've got a high quality item (that would probably cost around the same on the high street - I'm not going to make a fortune if I choose to sell these on etsy, unless I go for a cheaper supplier!). The one frustration I have is that I cant share the files with anyone, and I cant say, if you like it, here it is, get it printed up yourself, and I cant, at the moment, stick it up on etsy for sale even if I wanted to, due to the orphan works copyright restrictions. I talked at length with the NLS's Intellectual Property Officer, and we walked through why its just not legal, at the moment, for them to allow someone else to "publish" something that is in their collection and still in copyright without getting the holder's permission, and I understand this - although it doesnt mean I'm not frustrated by that. (You could get a license from the NLS yourself, if you wanted to use it for personal use). But of course, the law on the licensing of orphan works in the UK is changing very soon. 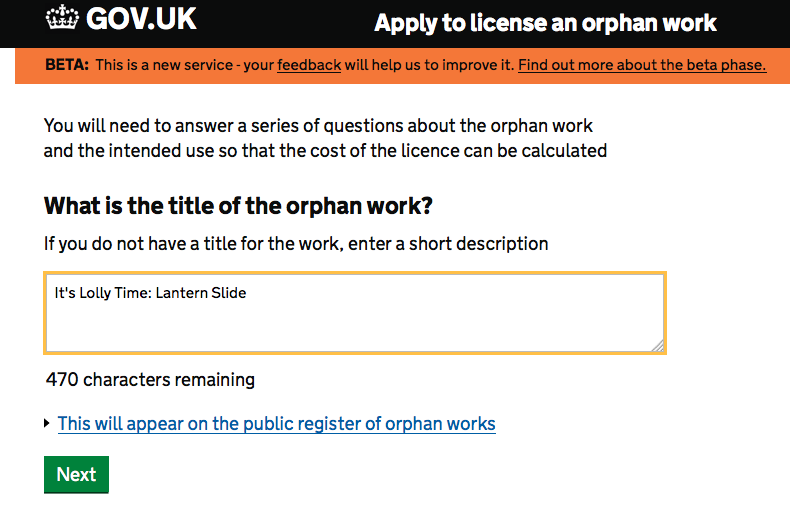 The upcoming orphan works licensing scheme (coming into force on the 29th October 2014) will allow that a person can obtain a license for commercial or non-commercial use of an orphan work on payment of a nominal fee and demonstration of a ‘diligent search’. (There's a PDF summary of this new scheme over at the Intellectual Property Office's website, with more on diligent search here). At time of writing, there is very little up there about how the process will work, or what the "nominal" fee would be (one person's nominal is another person's how-bleedin'-much?) but that's one to watch. 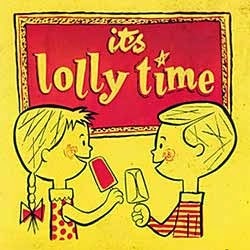 Come the end of October, I'll start a blog post chasing this image through the Orphan Works Licensing Scheme: who knows, within a few months, you may be able to make some It's Lolly Time! merchandise yourself, should you care to. It's been a fun journey, chasing something from idea to conception to manipulation to production. I've learned a lot about how we are delivering digital content to end users in the gallery, library, archive and museum sector, and also how frustrating it can be at times. But look, I've eventually ended up with a bespoke thing that I love, just for me. And once I've published this blog post, I'm going to start wearing the scarf that I made, just in time for winter-a-comin' in. *One final thing to say: eagle-eyed regular readers may know that I'm currently serving on the board of the National Library of Scotland, but I applied to use this image from my civilian, non-work, unidentifiable email account, so as not to get any special treatment in the process of licensing. It has to be said though, that being on the board was the reason I was flicking through past catalogues of their exhibitions in the first place! And I'm personally glad I found something in the NLS collections that so tickled me: a little bit of Scotland to remind me of where I'm from, and an emotional attachment to a piece of digitised cultural heritage. 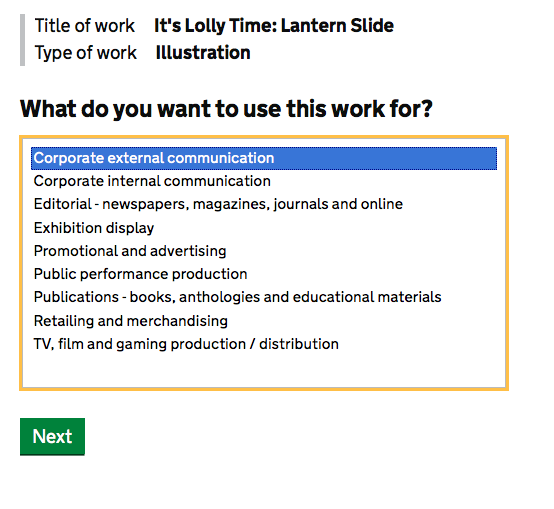 Reuse of Digitised Content (1): So you want to reuse digital heritage content in a creative context? Good luck with that. Although there is a lot of digitised cultural heritage content online, it is still incredibly difficult to source good material to reuse in creative projects. What can institutions do to help people who want to invest their time in making and creating using digitised historical items as source material? Over the last few months I have become increasingly interested obsessed with creative reuse of digitised cultural heritage content. We live at a time when most galleries, libraries, archives and museums are digitising collections and putting them up online to increase access, with some (such as the Rijksmuseum, LACMA, The British Library, and the Internet Archive) releasing content with open licensing actively encouraging reuse. We also live at a time where it has become increasingly easy to take digital content, repurpose it, mash it up, produce new material, and make physical items (with many commercial photographic services offering no end of digital printing possibilities, and cheaper global manufacturing opportunities at scale being assisted with internet technologies). What relationship does digitisation of cultural and heritage content have to the maker movement? Where are all the people looking at online image collections like Europeana or the book images from the Internet Archive and going... fantastic! Cousin Henry would love a teatowel of that: I'll make some xmas presents based on that lot! I'm not the only person interested in this: The British Library is currently tracking their Public Domain Reuse in the Wild, looking to see where the 1 million images they released into the public domain, and on Flickr, end up being used. At the moment, they manually maintain a list of creative projects of what people have got up to with their content. And people are using digitised stuff: pop over to a commercial fabric printing service like Spoonflower and you can see people grabbing creative commons images off Wikipedia and providing the means to print them on a whole range of materials for creative reuse. At Spoonflower, people are remixing images, providing opportunities for creative projects, designing and playing with available heritage content, using it as a design source and inspiration, although many dont quote the source of their hopefully out of copyright images used a basis for fabric design. Pop over to Etsy, and you can see (as the illustration above shows) high res images of historical art and culture turned into coasters, corsets, bangles, pillows, phone cases, jewellery, etc - and mashed up and remixed into further creations, all of which are for sale (although, again, where they got the source images from isnt usually made clear, and there are obvious copyright infringements happening in some cases). But overall, I'm left wondering why more use isn't made of online digital collections - and why we havent seen the "maker's revolution" where everyone is walking around going "this old thing? I cobbled it together from public domain images on wikimedia and had a tailor on Etsy run it up for me!" - or even see more commercial companies start to use this content as the basis for their home and fashion collections on the high street. There are now funding programs and efforts to help try and help the exchange between the "multiple sub-sectors of the creative industries and the public infrastructure of museums, galleries, libraries, orchestras, theatres and the like" and funds for "collaboration between arts and humanities researchers and creative companies" etc etc - in this this new "impact" world, allowing reuse of your content will probably score huge brownie points - but what can institutions be doing off their own back to make sure the digitised content they spent so much time creating is used, and reused, further? I was really impressed, at DH2014, to see Quinn Dombrowski have an entire wardrobe made with fabric designed using heritage content images in the public domain, and this inspired me to think: I should have a go at this. I should find something which is digitised and online, that I like, that I can access, that I can repurpose, and make something that I want and will use from it. What larks! But the rest of this blog post is an expression of sheer frustration at the current state of play of delivering digitised content online, for people who want to take digitised content, and reuse, and repurpose it. Before I get started: let me make clear that I'm entirely supportive of folks like the Rijksmuseum, LACMA, The British Library, and the Internet Archive making their out of copyright images freely available for folks to use. Its absolutely the right thing to do, and I'm not going to start railing against them (there are, of course, many institutions who haven't made their digitised content available and they deserve railing against.) But with that caveat in place, let's broach some frustrations of someone looking through digitised heritage content, wanting to get a decent image of something they want, to reuse in a way that they would like (whether or not that involves paying for the privilege - this isnt just about getting stuff for free, its about getting it at all). It isnt pretty. 1. So much stuff, such poor interfaces. Yay! so much stuff online! Europeana now has over 30 million items online from 2000 institutions! Flickr Commons has a tonne of stuff online! Flickr is now being used, independently of the commons, to host tens of millions of digital cultural heritage objects, by thousands of institutions! But for a user, browsing through this stuff, it is nigh on impossible to navigate or search Flickr in any meaningful way, and sift through this, simply because Flickr's interface is so poor (and often the content isnt tagged very well, so isn't very findable). What if institutions dont use Flickr? Dont get me started on content management systems, and their "user friendly" interfaces, such as Aquabrowser, or Digitool: shudder. Unless you know exactly what you are looking for, it's incredibly difficult for a user to browse and view content - and there is a lot of dross out there to sift through. Finding decent images that are interesting from a design perspective is a time consuming, utterly frustrating task. I speak from a few months of chuck-my-computer-across-the-room frustration in trying to navigate ( mostly unsuccessfully) what the cultural heritage sector has spent millions of pounds putting online. Suggestion: Institutions should use a little resources to get folk with any sort of graphic or design background help sort through the thousands or millions of images and present to their users a curated collection of a few hundred really good things which are ripe for using. Heck, put together some downloadable packs of images of art, logos, boats, trains, etc. 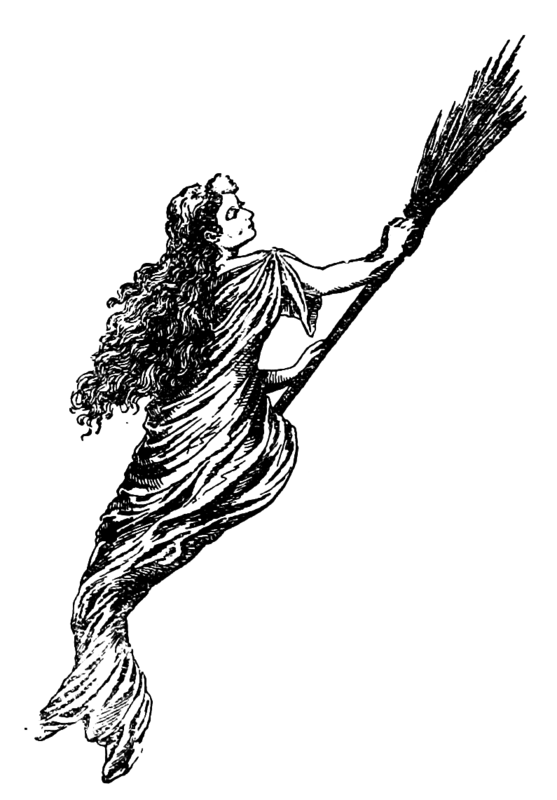 Here are 10 great images of witches you may like to play with! At the moment you are making users work too hard to sort through the digital haystack to find the interesting, usable needle. No wonder much of the content isn't used - people simply cant find it, or they walk away from your rubbish interface before finding that digitisation diamond. 2. The shackles of Copyright, part 1: aesthetic. The copyright free images which are put online free to use are out of copyright (duh) which means they are from a particular time period: generally pre-1920s (depending on the country's copyright laws). There's a lot of stuff up there, but an incredible amount of it is Victoriana, which has a particular aesthetic. This is great if you are into Steampunk (check out the first few pages of the Internet Archive book images Flickr stream and you'll see what I mean) but... having scrolled thought oodles of this stuff, it just doesnt float my boat. I'm into mid-20th-century design, so that puts me into an entirely different category of user: one who is going to have to sort out permission for reuse for items still in copyright, if the institution hasnt sorted out copyright before publishing online. B*gger. This isn't going to be as easy as it first appeared for me, then. Suggestion: Institutions should cherry pick a few in-copyright items that are really very reusable, and preemptively clear copyright under various licenses. Here are 10 fabulous 1950s illustrations which we have arranged for you to use under a creative commons license! (There is some of this stuff up on Flickr Commons, but it is in the minority). I understand the resources which are required for this, but really, institutions could be leading the way in making images of selected in-copyright items available and usable for people, to encourage uptake and creativity. 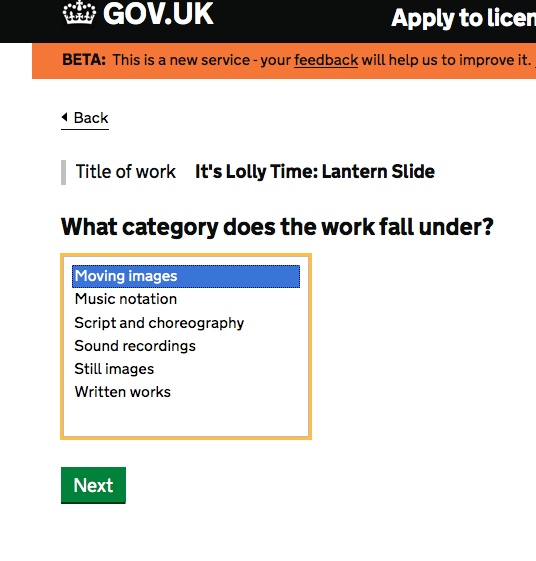 Or - at least - make processes for chasing copyright clearance a bit clearer to users. Information on that is very sketchy, to say the least, and its often impossible to even find out who in the institutions to email about rights clearances. 3. The shackles of Copyright, part 2: cowardice. Let's put aside the wonderful work of those who are bravely making their collections available for reuse, and arranging licensing for folks to do so, and address the majority of institutions who dont do this. Say you think... I'd like to make some of my own stationery! I know, I'll pop over to Europeana, and grab some cool images of old envelopes, and print up some notecards with those on (not to sell! just for my own use!). There's 6563 images labelled "envelope" currently in Europeana. The licensing for these - what you can and cant reuse - is incredibly confusing. Only 60 of these items have been put into the public domain. I have no issue with institutions wanting attribution when their images are reused - of course not - and you can do that with 592 images (although... how are you going to provide attribution on fabric or a cushion or a corset or a bracelet, etc). My beef is with the quarter of these digitised items which allow access but no further reuse of the images. Seriously, why not? What are you scared of? That someone is going to pop over to Photobox (other commercial photo printers are available) and make up some notelets? That someone will make a corset out of those image and sell them on Etsy? Quite frankly, if your stuff is out of copyright, and if you dont have the nous or cant afford to employ a graphic designer to turn your images of envelopes into going commercial concerns, good luck to anyone who can. I dont get why you would put images of old stuff online and say to the users "You can't use it. At all". What are you afraid of? (I also presume here that people wont use digital images when they dont have persmission to do so. Which is nonsense. People will take it and use it anyway). Oh yeah, you are saying, but copyright is complex, envelopes are manuscripts, manuscripts never go out of copyright, blah blah, till the cows come home. But just let people reuse digital content, and good luck to them. Seriously, what is the worst that could happen? That something archival takes off and becomes another "keep calm and carry on" meme? But really - wouldnt your institution love to be the source of one of those, for perpetuity? Yes, I did find a really good image of an envelope I wanted to use on some notecards, but couldnt get permission to do so (hence choosing it as an example). I'll address licensing and paying for image licenses in another blog post (I'm not averse to that either. At the end of the day, just let me reuse that cool image, even if I have to pay license costs to do so). All over the world, institutions are digitising cultural heritage content and putting it online with restrictive licensing which means that users cannot do anything at all with it (at least not without jumping through lots of begging hoops, or using it illegally). Not use it on a blog post. Not print it on a home made birthday card. Not make their granny a key ring with it on. Not make a scholar who is an expert in this field a mug with it printed on for their retirement present. This seems absolutely bonkers to me - and a complete waste of limited resources in the sector. What "access" do you think you are actually providing, if its only of the "look but dont touch" variety? Suggestion: if you arent going to monetise it yourself, just make it available for others to reuse, with a generous license. Go on! All I want is a clear, 300dpi (or higher) image of the digitised item. Its no use saying "this is in the public domain!" if you only provide 72dpi: you cant do anything with that, except stick it up on another webpage. Just give me a reasonably high resolution image, and let me go and play with it. Cheers! So, so much of the "public domain" material is quite low resolution, which stops people from using the images for creative purposes. Maybe that was your plan all along (ha ha! we'll put this online but only at low resolution! that'll thwart those corset makers!) but seriously, 300dpi. Let folk have at it. One other point: if you are using algorithms to crop lots of stuff before sticking it up on Flickr, please make sure that it works, and isnt cropping things too tightly. I understand that its all about efficiency and storage capacity - you dont want to be storing tens of millions of blank pixels and paying for hostage for empty content - but if you crop things too closely, its just unusable. Another reason I stopped looking for images in the Internet Archive Book Images Flickr pool was all the ones I want were shaved off. I know! I'll make a montage of ye olde fruit and veg! except this apple is cut off at the bottom, these carrots are missing part of their top, this apple sliced right through, as are these peaches. Thanks for offering to give me all this stuff free, but its unusable for creative purposes unless you give me a whole illustration, not one that has been chopped off around the edges. Suggestion: 300dpi, at least. Cheers, love. Its worth just remembering that you may be making some content freely available, but its still actually quite costly for people to do anything creative with it where digital printing is concerned, especially in small print runs, making individual items, etc. It takes significant investment of time and resources to take an archival tiff and turn it into, say, a cushion (or a corset). I'm not really sure what I'm trying to say here in making that point (isnt that what ranty blog posts are for?)... perhaps it offsets the feeling that institutions are giving this stuff away for nothing: people reusing digital images are putting in significant time and often money to turn them into something else. It becomes co-creation, rather than mere duplication. Or something. It's certainly not an activity that is available to those without the skills to do image manipulation (despite many publication features being available on these commercial digital image printing websites: if you want to do anything that deviates from very simple printing, it still takes time and effort to set up). It still takes skill and resources and sometimes training and probably talent to make something nice and that people will want from something someone else has digitised, and it often takes a huge amount of time. It certainly surprised me how long the selection and preparation of items takes before you get to the stage of sending something to the print shop. So let's all proceed in a realm of mutual respect and adoration, yeah? Love the provision of high quality digital heritage imaging online: love the people who have the sewing chops to make the corsets. (There are also ethical considerations if people start sending high resolution images of items to be made into products in "cheaper" international production contexts, but I'm not sure realistically how that can be broached by image licensing). Suggestion: Wonderful things can happen when individuals work with institutional digitised content! sometimes. Put out of copyright material in the public domain to encourage reuse. Go on! what are you scared of? Provide 300dpi images as a minimum. Curate small collections of really good stuff for people to reuse. Present them in downloadable "get all the images at once" bundles, with related documentation about usage rights, how to cite, etc. Think carefully about the user interface you have invested in. Have you actually tried to use it? Does it work? Can people browse and find stuff? Really? Make sure the image quality is good before putting it online. Dont chop bits off illustrations. Make rights clearer. Give guidance for rights clearance for in-copyright material, and perhaps provide small collections with pre-cleared rights, to allow some 20th Century Materials to be reusable. What do we want! Curated bundles of 300dpi images of cultural heritage content, freely and easily available with clear licensing and attribution guidelines! When do we want that? Yesteryear! So what about me, and my task? Did I find something that I like, that I can access, that I can repurpose, and make something that I want and will use from it? After a few months trawling digitised collections online, I eventually stumbled across something which I adore, which got sent off to the print shop last week. I'll be waiting by the postbox over the next few days, in the hope that my investment in time and resources has paid off: I cant wait to see it IRL. But that, my friends, is for another blog post. And in the meantime, I leave you with this conclusion: institutions can be doing so, so much more to help those wanting to use digitised content creatively. A decade ago, in my first year as lecturer in a Humanities department, an eminent Professor helped me secure a book contract with a top university press for my recently completed doctoral thesis. Another senior colleague stopped me in the corridor: “This is very rare,” she said. “And this is what gets you ahead in this game.” The book itself is a lovely object, of which I’m still very proud (it took me four years of doctoral research, plus another two years of preparation). It only sold a few hundred copies: enough to make the press happy, and to give me annual royalties of a fiver. There is an ebook, comparable in price to the physical version, but no Open Access version. Despite little proof that it is well read, it has been cited just enough to give me another elusive point on the dreaded H-index. We don't write Humanities monographs for riches, we may do for an attempt at academic fame, but the career kickback for me was rapid promotion. In the Humanities, the monograph’s the thing. scholars, and publishers, should be paying attention. How will small-print runs of expensive books fare in this new “content should be available for free” marketplace? How will production costs be recouped? Predatory models are already emerging, with established presses offering Open Access monographs alongside the print version for an all inclusive £10,000 charge to offset a presumed (but not proven) fall in revenue: out of the reach for most individual academics, or many institutions. I certainly couldn't have afforded those costs, a junior academic fresh out of the doctoral pod, with student debt hanging around my neck. Will I publish another monograph without an associated Open Access version? No, but getting published in the first place is the important thing. What advice do I have for early career researchers looking to publish their doctoral thesis, especially if they had the chance to do so with a strong, established academic publisher? The monograph is still the thing: anyone who wants to be taken seriously as a scholar in the Humanities should work towards having one. Open Access requirements are on the horizon, so broach them with the publisher. Don't accept £10,000 costs. Brandish this survey, say People Still Buy Books. Ask for help from those further along the academic path to help you navigate the pre-contract stage. Even with the changing publishing environment, some things stay the same: the importance of the physical single author monograph, and the importance of academic patronage.